8:55 a.m. – A citizen came into the police department to report a motor vehicle accident. 11:12 a.m. – A motor vehicle accident occurred on Old Post Road. 12:28 p.m. – Suspicious activity was reported on Seapoint Road. 12:58 p.m. – A theft was investigated on Pocahontas Road. 1:20 p.m. – An alarm from a location on Shapleigh Road was determined to be a false alarm. 3:24 p.m. – A two vehicle motor vehicle accident occurred on State Road. 3:56 p.m. – An officer responded to the intersection of State Road and Walker Street for a motor vehicle accident involving two vehicles. 4:39 p.m. – A dispute between a landlord and tenant was reported on Manson Ave.
6:21 p.m. – The area of Bicknell Street was checked for a speeding vehicle. 7:30 p.m. – A resident of Melanies Court reported the loss of their glasses. 10:22 p.m. – Suspicious activity was investigated on Traip Ave.
6:42 a.m. – An alarm from Shepard’s Cove Road was investigated and found to be a false alarm. 10:12 a.m. – A motor vehicle accident occurred on Pepperrell Road. 10:30 a.m. – Officers responded to Wilson Road for a motor vehicle accident. 11:34 a.m. – An officer assisted another agency. 11:43 a.m. – A two vehicle motor vehicle accident occurred on US Route One. 11:55 a.m. – Officers responded to Shapleigh Road for a motor vehicle accident. 12:26 p.m. – A motor vehicle accident occurred on US Route One. 1:10 p.m. – An officer assisted another agency on Oak Ter. 2:05 p.m. – A hit and run accident occurred on US Route One. 2:15 p.m. – Officers responded to Route 236 for a tracker trailer truck that rolled over. 5:55 p.m. – A report of suspicious activity on Manson Ave was investigated and determined to be unfounded. 10:14 a.m. – A wallet was found on State Road. 12:14 p.m. – A citizen came into the police department to report fraud. 2:05 p.m. – A dog was reported lost from a residence on Martin Road. 4:39 p.m. – An officer assisted with a civil issue on Brave Boat Harbor Road. 5:50 p.m. – A report of suspicious activity was received from a location on US Route One. 9:31 p.m. – An alarm from a business on US Route One was determined to be a false alarm. 11:10 p.m. – Following a motor vehicle stop of State Road Allen D. Pierce, 45, of 37 Rogers Road #B was arrested for operating under the influence. 6:15 p.m. – A subpoena was served on Main Street. 7:19 p.m. – An officer checked on a vehicle on Whipple Road for a possible drunk driver. The report was determined to be unfounded. 2:58 a.m. – The area of Ledgewood Drive was checked for suspicious activity. 9:23 a.m. – The animal control officer responded to Shapleigh Road for a report of stray dogs. 2:40 p.m. – A two vehicle motor vehicle accident occurred on Picott Road. 3:44 p.m. – An officer checked on a dog left in a vehicle on Ledgewood Drive. 5:45 p.m. – Found syringes were reported on US Route One. 6:05 p.m. – A dog was reported loose on the I-95 freeway. 6:17 p.m. – An officer assisted another agency on US Route One. 7:44 p.m. – A suspicious vehicle on State Road was checked. 9:03 p.m. – A citizen came into the police department with a cat they found on Wallingford Square. 10:29 p.m. – An officer checked on suspicious activity they observed in the area of Bridge Street and Cook Street. 12:19 a.m. – Ronald B. Fagans, 40, of 12 Barton Place, Queensbury, NY was arrested for operating under the influence and operating vehicle without license. 12:21 a.m. – An officer responded to Rice Ave for a report of disorderly conduct. 12:51 a.m. – Following a report of a domestic disturbance on Cole Street Shay A. Hoos, 38, of 9 Cole Street was arrested for domestic violence assault. 3:07 a.m. – An officer initiated a motor vehicle stop on State Road. 10:29 a.m. – A two vehicle motor vehicle accident occurred on the US Route One Bypass. 3:21 p.m. – A disturbance was reported on Seapoint Road. 3:41 p.m. – The area of Shapleigh Road was checked for a suspicious male. 4:47 p.m. – Suspicious activity was reported on US Route One. 4:48 p.m. – Zakary Joao Bettencourt, 22, of 71 Endicott Road, Peabody, MA was arrested on another agency’s warrant. 6:32 p.m. – Following a motor vehicle accident at the intersection of State Road and Walker Street Paul Mulcahy, 57, of 2 Mill Street #250, Dover, NH was arrested for operating under the influence. 4:02 a.m. – The area of Norton Road was checked following a report of suspicious activity. 9:35 p.m. – An officer assisted another agency. 3:53 p.m. – Another agency was assisted on Dana Ave.
4:11 p.m. – Alvin Dorsey, 28, of 6 Skyline Drive, Braintree, MA was arrested on another agency’s warrant. 5:10 p.m. – A two vehicle motor vehicle accident occurred on State Road. 7:45 p.m. – A noise complaint was received from Boush Street. 11:06 p.m. – The area of Whipple Road was checked for a possible drunk driver. 9:32 a.m. – An officer assisted the fire department on Boush Street. 9:39 a.m. – A lost and found bicycle was reported on State Road. 9:50 a.m. – A citizen reported a case of harassment. 2:02 p.m. – Paperwork was served on Cromwell Street. 2:20 p.m. – Someone came into the police department to advise they had witnessed an accident on the I-95 Freeway. 3:12 p.m. – An officer attempted to serve a summons on State Road. 4:22 p.m. – A motor vehicle accident was reported on Pepperrell Road. 5:50 p.m. – Subpoenas were served at the police department. 7:20 p.m. – A report of theft on Brave Boat Harbor Road was investigated. 7:20 p.m. – An officer responded to Cromwell Street for a report of a violation of a court order. 9:36 p.m. – A report of disorderly conduct on State Road was investigated. 7:40 p.m. – Following a report of disorderly conduct on Cole Street Benjamin Nawfel, 26, of 38 Cole Street was arrested for domestic violence assault. 9:38 p.m. – A report of a violation of a court order was determined to be unfounded. 11:15 p.m. – An alarm from a location on Williams Ave was found to be a false alarm. 4:59 a.m. – A report of suspicious activity on US Route One was investigated and services were rendered. 7:24 a.m. – A citizen came into the police department to turn in an article found on Wallingford Square. 8:54 a.m. – A two vehicle motor vehicle accident occurred on Wallingford Square. 9:44 a.m. – An officer assisted another agency on Ledgewood Drive. 12:31 p.m. – Officers assisted another agency on the I-95 Freeway. 3:35 p.m. – A juvenile issue was reported on Williams Ave.
6:18 p.m. – A two vehicle motor vehicle accident occurred on Wilson Road. 6:59 p.m. – An officer responded to Dennett Road for a report of Public intoxication. Upon arrival, the officer determined that the report was unfounded. 9:22 p.m. – An officer checked on a report of suspicious activity on Old Dennett Road. 6:11 a.m. – A disturbance was reported on Ledgewood Drive. 6:59 a.m. – An alarm received from a business on the US Route One Bypass was investigated and determined to be a false alarm. 1:01 p.m. – A resident came into the police department to report an animal complaint that occurred on Cromwell Street. 1:38 p.m. – A lost and found article was reported on Williams Ave.
2:46 p.m. – A report of a violation of a court order was investigated. 4:22 p.m. – Another agency was assisted on Route 236. 5:45 p.m. – Paperwork was served on Moore Street. 5:50 p.m. – Paperwork was served on State Road. 6:06 p.m. – Paperwork was served on Cromwell Street. 7:38 p.m. – A report of a shoplifter was received from a business on US Route One. 8:36 p.m. – A report of suspicious activity on State Road was investigated and determined to be unfounded. 9:08 p.m. – An officer responded to Gee Road to check on suspicious activity. 9:40 p.m. – An officer checked on suspicious activity they observed on Route 236. 10:14 p.m. – Suspicious activity on Parsons Lane was reported. 11:02 p.m. – Following a motor vehicle stop on Rogers Road, Wayne A Lamoureux, 49, of 14 Goodrich Street was summonsed for operating with suspended registration. 11:39 p.m. – An officer assisted another agency on Halstead Street. 10:07 a.m. – An individual came into the police department to speak to an officer regarding a landlord/tenant issue. 2:49 p.m. – A motor vehicle accident occurred on US Route One. 8:42 p.m. – A report was received of disorderly conduct on Page Street. 9:29 p.m. – An officer responded to UR Route One for a report of a domestic disturbance. 11:52 p.m. – Following a motor vehicle stop on US Route One Jessica M. Keefer, 27, of 8 Peter Weare Road, Cape Neddick was summonsed for operating while license suspended or revoked, and Nicholas S. Keefer, 25, of 8 Peter Weare Road, Cape Neddick, was arrested on a warrant. 8:17 a.m. – An alarm from Kings Court was determined to be a false alarm. 8:37 a.m. – A restraining order was served on Moore Street. 9:41 a.m. – A resident came into the police department to report fraud. 1:22 p.m. – An officer responded to a location on I-95 for a report of suspicious activity. 5:05 p.m. – An alarm from Newson Ave was investigated. 5:07 p.m. – Criminal Trespass was reported on US Route One. 7:32 p.m. – A report of disorderly conduct was received from a resident on Bridge Street. 6:28 p.m. – A citizen came into the police department to report an animal complaint that occurred on Pocahontas Road. 8:29 a.m. – An officer initiated a motor vehicle stop on US Route One. 11:27 p.m. – A two vehicle motor vehicle accident occurred on the US Route One Bypass. 5:55 p.m. – A citizen came into the police department to report keys that were lost on Chauncey Creek Road. 6:06 p.m. – A dog was found on Moore Street. 6:17 p.m. – A resident reported a telephone scam. 6:45 p.m. – An officer investigated an attempted theft that occurred on Cutts Island Road. 8:32 p.m. – An alarm received from a business on US Route One was determined to be a false alarm. 6:23 a.m. – An alarm from a business on US Route One was investigated and found to be a false alarm. 6:27 a.m. – A dog was reported missing form a residence on Spruce Point Road. 7:51 a.m. – An officer checked on a suspicious vehicle on George Street. 10:55 a.m. – A purse was reported lost on Devon Woods Drive. 3:35 p.m. – A two vehicle motor vehicle accident occurred on Walker Street. 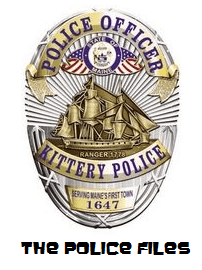 4:16 p.m. – A dog bite that occurred on Dunlea Ave was investigated. 4:40 p.m. – An officer attempted to serve paperwork on Gray Lodge Road. SOME FOLKS HAVE ASKED WHAT DOES A REAL LOG LOOK LIKE. HERE IT IS BELOW WITH REDACTED INFORMATION AS REQUIRED BY LAW. This entry was posted in General Town News on September 29, 2014 by Chuck Denault.